But I still love this one. It’s no rhino and unicorn, but it ain’t bad. Well, nothing compares to Rhino and Unicorn, of course, but I have to say this one definitely spoke to me today, too :). Too funny (and sadly, all too true). Gonna have to add that one to my cat-macro screen saver. I almost sent that to you, too! I found you a LOLcat … but I forgetted it. 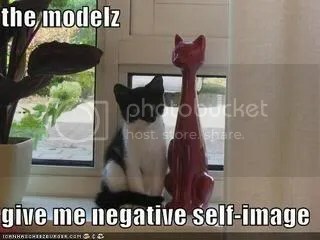 I’m addicted to that lolcats website. I found you a LOLcat … but I forgetted it. Someday, I will stop being amused by lolcats. But I really can’t imagine when. What’s incredible is that “LOLcats Bible.” When PortlyDyke posted about that on Shakesville, I about peed my litterbox. The can feel embarrassment from running into a glass door or falling off the bed, but they don’t feel shame just for being what they are. And Phledge, will you accept bribes to upload that picture and share it with us? Because I think that would make my month. OBTW LOLcatz Bible is teh awsum!